Although it may seem gruesome to us, the Egyptians removed certain body organs and placed them into special jars as preparation for the afterlife. 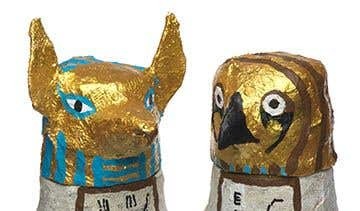 Here we have two traditional animal gods Quebhensenuef (kwa-ben-zen-uff) the falcon and Duamutef (dew-a-moot-eff) the jackal. 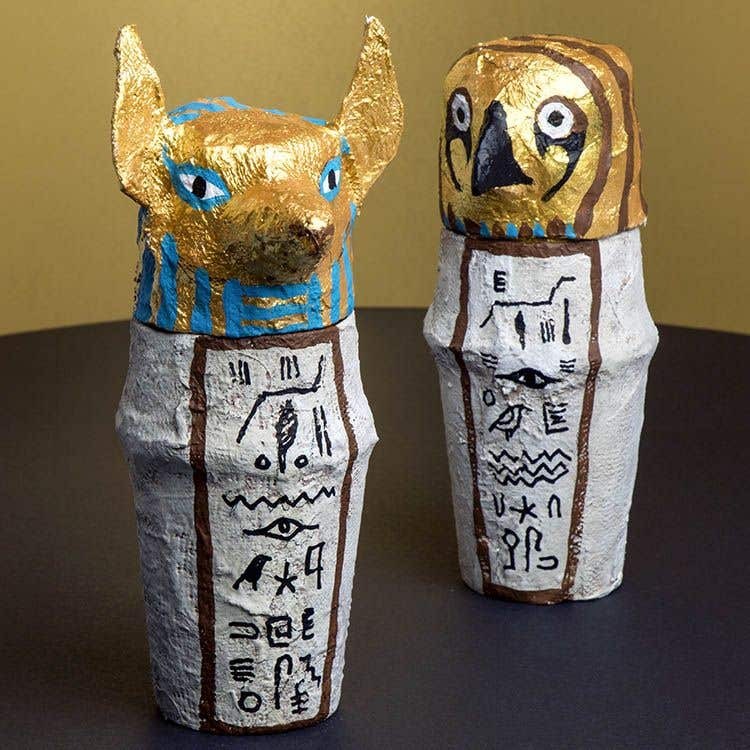 This project can help children further their understanding of the important rituals in Ancient Egypt as well as being a creative exercise – as no two canopic jars were the same! 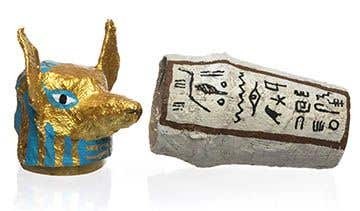 The jars can be decorated hieroglyphs or other patterns. Use a ruler and pencil to mark a line 5cm from the base of a paper cup. Cut down to the line from the top of the cup then around the line, so you have 2 separate sections. To make the lower part of a jar, stick together the ends of the top section cut from the cup then tape it onto another paper cup, with the 2 rims placed together. To make the lid of a jar, use the base section cut from the paper cup. To make a jackal head, scrunch up a piece of plastic bag or tissue paper (30cm x 30cm), wrap it tape to make a nose shape then tape it onto the side of the cup. Tape card ears to the side of the cup. For the falcon, tape a card beak on the side of the cup. For both shapes, tape a scrunched up bag or tissue paper to make rounder top on the heads. To help the lid fit more securely onto the bottom section of the jar, tape (or glue) a 2cm x 18cm thin card strip around the bottom of the lid, inside the cup, leaving 1cm overhanging the edge. Place the lid onto the bottom section of the jar to check it fits then separate them before covering in Mod Roc. Dip Mod Roc strips into water for a few seconds, squeeze out any excess water before layering the strips over the 2 sections of the jar. Smooth the plaster over the cups and the card shapes until both sections are covered on the outside. Leaving the card strip around the rim of the lid uncovered. Leave Mod Roc to dry overnight. Keeping the 2 pieces apart, cover the lid and bottom section of the jar with a base colour, for example paint the lid gold and use a stone colour for the bottom then leave to dry. Paint inside the jar too. Lightly draw the position of the eyes and other patterns with a pencil then carefully add colour over the top using paint with a thin brush or Deco pens. 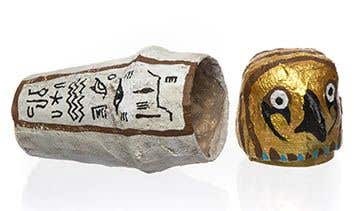 NOTE: For more ideas on decoration, look at some pictures of canopic jars to find out about the different designs from Ancient Egypt. Before you start working with Mod Roc cover your work surface, cut Mod Roc strips into 20cm lengths and fill a bowl with water. You may find it easier to wear disposable vinyl gloves for using Mod Roc as its quite messy!